Your basement doesn’t have to be just a dark dungeon where you store your Christmas decorations. Finishing your basement can actually give you more benefits than you may think. Not only can you add more living space and increase the market value of your home, it can also increase your home’s energy efficiency! The team Rendon Remodeling can work with you to create the perfect living space in that unfinished basement. Obstacles like low ceilings, water heaters and poor lighting are all issues that Rendon Remodeling were made to overcome. 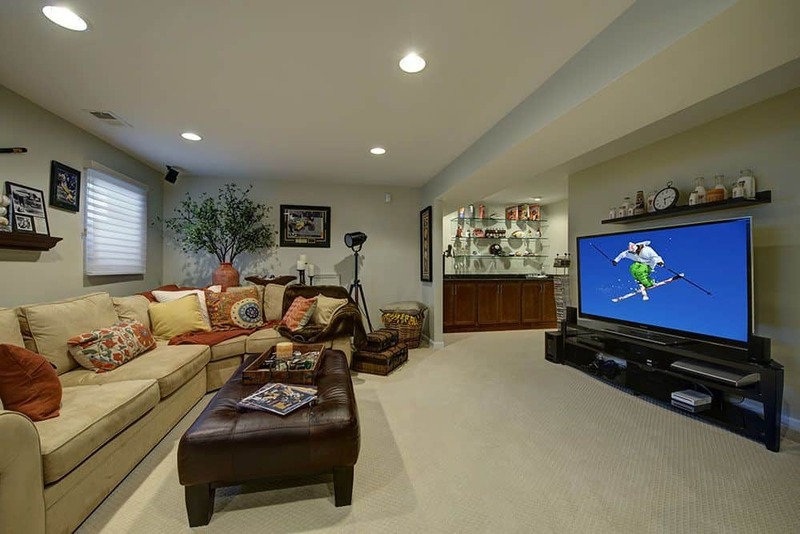 Deciding how you will use your basement will determine how you approach the design. There is no right or wrong way to set up your space, but you do have to focus on what you want the most out of your basement. You may have your heart set on a home gym, guest bedroom and office. If your budget or space is tight, you’ll need to decide what your priorities are for the space. 1. Don’t put viewing screens near a window. 2. It isn’t necessary to have high ceilings in a media room because you’ll mostly be seated when you’re there. 3. You can create platform seating to increase visibility just like in a movie theater, with the second row of seats raised up behind the first. Theater seating can get pricey, but the platform won’t add much expense to the budget. 4. You’ll want to insulate the walls of a media room, not just the exterior walls, to dampen sound. Building code standards consider a room to be a bedroom when it contains a finished closet, meaning the drywall, trim and doors are up. If you have a bedroom in the basement, you must have an egress window no more than 44 inches off the ground. You can create a step up or enlarge the window if necessary to meet code. Try to place the bathroom adjacent to the bedroom with a direct entrance from inside. If you install a shower there needs to be enough ceiling clearance to lift your arms without hitting anything, and you need a fan to exhaust to the outside. These spaces tend to trip up homeowners. You will need to be careful and measure all your exercise equipment to make sure you have the necessary space to work-out, especially if you have a basement with a lower ceiling. You will need to account for your own height on certain machines like pull-up machines or treadmills. Also you will need to check your exercise equipment to see if it is welded together or bolted together to make sure it will fit down any stairs or turns into the basement. This should ideally be the same size as a bedroom, but keep in mind that if you add a closet, it actually is a bedroom according to code and will need an egress window. Because home offices don’t have the same privacy needs as a bedroom, using a double set of French doors on basement offices can maximize light and keep a feeling of openness. Keep in mind that installing a bar is the same as installing a new kitchen without appliances, so your expense will be comparable. The possibilities are truly limitless! Contact the team at Rendon Remodeling and let us work with you on creating the space of your dreams. Rendon Remodeling & Design, LLC can help you design a plan that works best for your family’s needs.